483 Beacon is located on the SE corner of Beacon and Massachusetts Avenue, with 481 Beacon to the east, 491 Beacon to the west, across Mass. Ave., 492 Beacon to the north, across Beacon, 411 Marlborough to the south, across Alley 414. 483 Beacon was designed by Willard T. Sears and built in 1898-1899 for Washington Butcher Thomas, who is shown as the owner on the original building permit application, dated February 17, 1898. It was known as Hotel Cambridge or The Cambridge, and between 1900 and 1921 was listed under the address 485 Beacon. Washington Thomas and his wife, Caroline (Wadleigh) Thomas, lived at 20 Gloucester. He was a sugar manufacturer and an investor in real estate. In 1895-1896, he had built The Marlborough apartments at 416 Marlborough. A February 9, 1898, article in the Boston Globe described the new building as “a handsome new apartment house from plans by Willard Sears” which will be “97 feet high, eight stories of steel construction, with brick and stone exterior” at a “total cost above the land” of $250,000. 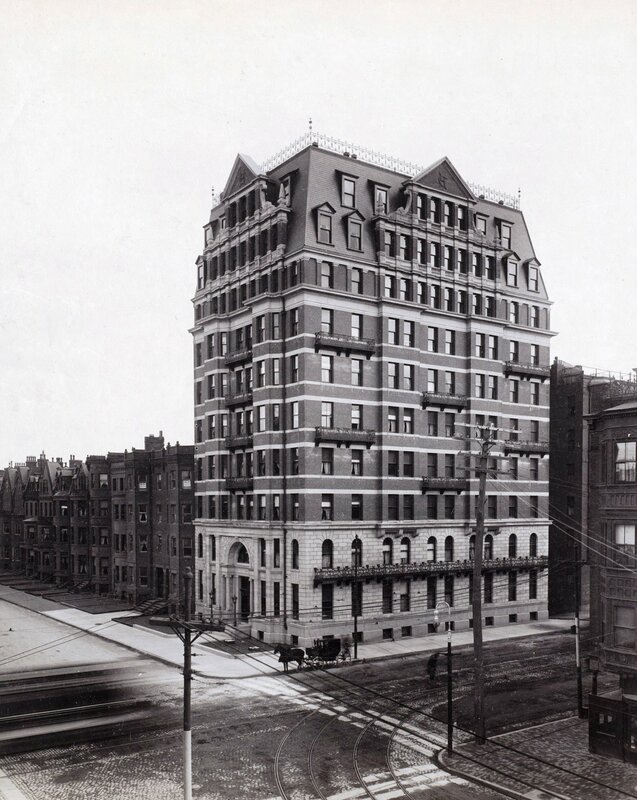 The new building was built on two lots, a vacant lot at the corner of Beacon and Massachusetts Avenue, and the lot to the east, the former location of a four-unit apartment house at 483 Beacon, one of three (479-481-483 Beacon) designed by architect Ernest N. Boyden and built in 1891. Washington B. Thomas had purchased 479 Beacon and 481 Beacon in June of 1892. On April 24, 1896, he purchased 483 Beacon and on May 2, 1896, he purchased the vacant lot at the corner. He subsequently razed 483 Beacon and retained 479-481 Beacon. The land where 479-481 Beacon and the Hotel Cambridge were built originally had been part of a 375 foot parcel purchased by architect John Hubbard Sturgis on January 24, 1880, from a real estate investment trust formed by Grenville T. W. Braman, Henry D. Hyde, and Frank W. Andrews. The trust had purchased the land from the Boston Water Power Company on March 1, 1872. The 375 foot parcel was one of three John H. Sturgis had purchased in January and February of 1880 comprising all of the land on the south side of Beacon from a line 198 feet west of Hereford to Massachusetts Avenue, with a frontage of 442 feet. John H. Sturgis sold some of the land before his death in February of 1888, and his widow, Frances Anne (Codman) Sturgis, sold the remainder to various purchasers. The last lot sold was the corner lot purchased by Washington B. Thomas in May of 1896. 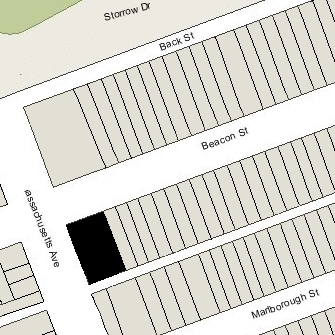 Click here for an index to the deeds for 483 Beacon, and click here for further information on the land on the south side of Beacon between Hereford and Massachusetts Avenue. The apartment house at 483 Beacon had been occupied since the 1891-1892 winter season. It and its companion buildings at 479-481 Beacon had been built by John Hurley, mason, for real estate dealer Seth Russell Baker, who had purchased the land from Frances Sturgis on January 20, 1891. He sold all three buildings on October 1, 1891, to Eugene H. Fay, an associate of real estate dealer Henry W. Savage, who was the leasing agent for the apartments in all three buildings. On October 30, 1891, 483 Beacon was purchased from Eugene Fay by Charles W. Claggett, a real estate dealer. On October 1, 1893, the building was damaged by a two-alarm fire. According to the Boston Globe article on the fire, the “principal damage was to the top story, occupied by G. H. Hathaway of the Redpath Lyceum bureau.” It subsequently was re-occupied before it was purchased by Washington B. Thomas. By the 1899-1900 winter season. the first residents of the Hotel Cambridge had made it their home. On December 26, 1911, Washington B. Thomas created the Marlborough Real Estate Trust, with Leslie C. Wead and Edward Peirce as trustees, to hold his real estate assets. When he established the trust, he transferred the Hotel Cambridge, The Marlborough, and the Symphony Chambers (located at 327 Massachusetts Avenue and 242-248 Huntington) to the trust, and on January 19, 1912, he transferred 479-481 Beacon to the trust. By the mid-1920s, 479-481 Beacon and the Hotel Cambridge had been converted to be primarily medical offices, with some residential apartments. Washington B. Thomas died in May of 1929. On December 29, 1933, the Marlborough Real Estate Trust transferred 479-481 Beacon, the Hotel Cambridge, and The Marlborough to a trust that Washington B. Thomas had created in April of 1920 for the benefit of his wife, Caroline, and their children, Helen (Thomas) Warren, the wife of Samuel Dennis Warren, III, and Margaret (Thomas) Gardiner, the wife of William Tudor Gardiner. Herbert G. Sumner, William Tudor Gardiner, and Walter E. Hewins were the trustees. They held all of the outstanding shares of the Marlborough Real Estate Trust, which they terminated in conjunction with the transfer. Caroline (Wadleigh) Thomas died in May of 1939. The Thomas family trust continued to own the property until the mid-1950s. On March 1, 1955, 479-481 Beacon, the Hotel Cambridge, and The Marlborough were acquired by Miss Katherine F. Ladd. She was a secretary with Dreyfus Properties, which managed the buildings, and held them in her name on their behalf. She lived in Roslindale. In the spring of 1970, Dreyfus Properties merged with another real estate firm, Theodore W. Berenson and Associates, to form Berenson Corp.
On March 10, 1971, 479-481 Beacon and the Hotel Cambridge were purchased from Katherine Ladd by Harold Brown, a real estate developer, and Leonard S. Green, a former Dreyfus Properties executive and subsequently vice president of Berenson Corp., as trustees of the Beacon Towers Trust. 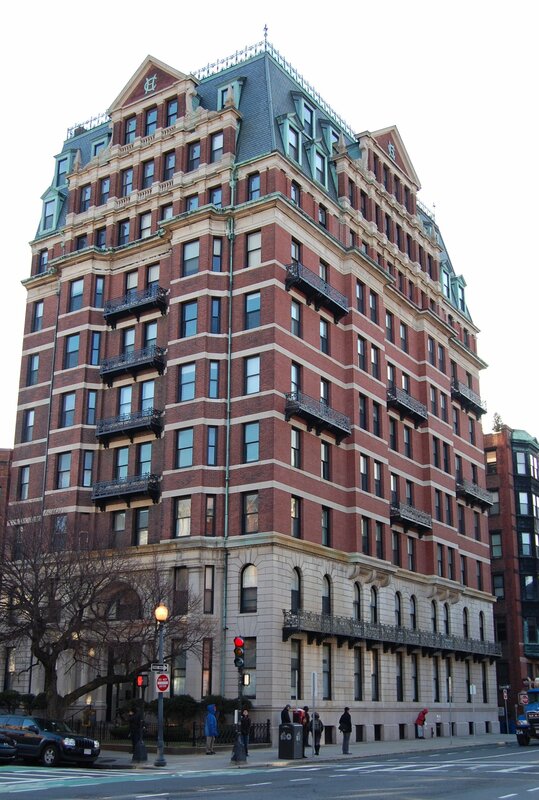 On the same day, The Marlborough was acquired by Leonard S. Green, Theodore W. Berenson, Albert L. Manley, and Joel B. Wilder – all executives of Berenson Corp. — as trustees of the Back Bay Trust. On February 10, 1982, the Beacon Towers Trust converted the property into the Beacon Towers Condominiums with 85 Units: 8 units in 479 Beacon, 8 units in 481 Beacon, and 69 units in the Hotel Cambridge at 483 Beacon. On April 7, 2010, the building was seriously damaged by a 9-alarm fire that originated in a seventh floor unit. It was reoccupied after several years of repairs and remodeling.